This post by Matt McDonough appeared in themeparkinsider.com. Follow link below for original report and video. All of this does bring up some rather interesting points. In my last article I discussed the failure of Disney’s America and how one reason for its demise was the charge of “Disneyfication” — that Disney could not do justice to history and thus would ruin the experience by whitewashing sensitive subjects. Yet in the case of Pirates of the Caribbean, the opposite occurred. 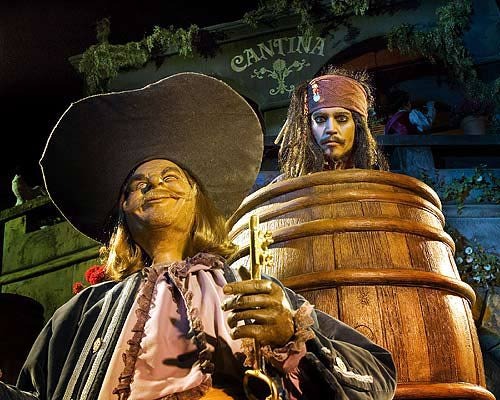 The lustful pirate, while historically accurate, was deemed insensitive and thus removed to make the attraction more family friendly. But when we really think about it, the ride is far from family friendly. The altered chase scene now features pirates who have looted goods. The pirates still set fire to the town and then, toward the end, we are greeted by the sight of drunken swashbucklers recklessly shooting firearms at each other in a room full of explosives. Thus according to the current mindset alcoholism, attempted murder, robbery, theft, and arson are all acceptable but a pirate chasing a girl crosses the line. The main question still remains — can history and theme parks co-exist, or are we doomed to jump from controversy to controversy whenever the two meet?